In some familial forms of amyotrophic lateral sclerosis, mutant astrocytes damage neighboring neurons. Researchers do not know how. In the October 26 Nature Neuroscience online, scientists report a vital clue: Those mutant astrocytes are rife with a protein dimer comprising a sodium/potassium ATPase and an actin-binding protein. Blocking the ATPase protected neurons in culture and in mice. The results point to a potential therapeutic target for both familial and sporadic ALS. In fact, digoxin, a drug used to treat heart failure, blocks ATPases. However, digoxin at typical doses may not cross the blood-brain barrier efficiently enough to make a difference, pointed out senior author Azad Bonni of Washington University in St. Louis. Co-culture of wild-type neurons (green) with mSOD1 astrocytes normally results in neurodegeneration (top). When researchers blocked 2-Na/K ATPase activity, the neurons survived (bottom). First author Gilbert Gallardo and colleagues did not start out looking for an ALS treatment. They found the actin-binding protein when they tested an antibody for FOXO transcription factors on spinal cord lysates from mice carrying mutant human superoxide dismutase 1 (SOD1). “To our surprise, we saw a very strong band … but it was at the wrong size,” Bonni told Alzforum. The researchers wondered if it might be some kind of modified FOXO and decided to identify the protein. Bonni’s group has studied the role of these transcription factors in oxidative stress (Lehtinen et al., 2006). In fact, mass spectrometry showed that the mystery band contained α-adducin, an actin-binding protein. Adducins cap actin filaments to control their length (Matsuoka et al., 2000). Using different antibodies to adducin, Gallardo and colleagues observed that both the protein and its phosphorylation were upregulated in mSOD1 mice once they reached 90 days old, which is just when ALS-like symptoms begin in these animals. At this point, Bonni and Gallardo suspected adducin might be poisoning the motor neurons of the sick mice. Immunohistochemistry brought another surprise: The α-adducin co-localized with a marker for astrocytes, not neurons. As Gallardo was performing these experiments, researchers in the ALS field were also focusing their attention on astrocytes. Several studies indicated that mSOD1-toting astrocytes, and even astrocytes from people with sporadic ALS, release some factor that damages wild-type motor neurons, (see Apr 2007 news story; Feb 2014 news story). Researchers have not yet figured out what that substance might be or what promotes its release. Bonni realized they might have stumbled onto part of the answer. To investigate further, they co-cultured astrocytes expressing mSOD1 with wild-type primary spinal motor neurons. As other researchers have reported, the mutant astrocytes killed the neurons. 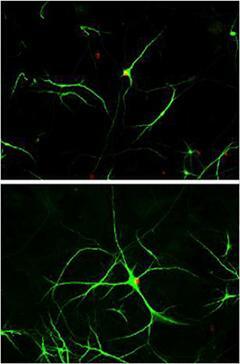 Treating the astrocytes with interfering RNA to knock down α-adducin blocked the neurotoxicity. Gallardo saw the same protection in mSOD1 mice. When he injected a lentivirus with α-adducin-interfering RNA into one side of the lumbar spinal cord of the animals, more motor neurons survived than on the untreated side of the cord. To better understand how α-adducin contributes to neurotoxicity, the authors looked for binding partners. They immunoprecipitated adducin from mSOD1 mice and used mass spectrometry to identify proteins that came along for the ride. One partner was the α2-Na/K ATPase. Previous research has indicated that adducins might activate these ion pumps in the kidney (Ferrandi et al., 1999). Astrocytes in mSOD1 mice overproduced the α2-Na/K ATPase, as they did α-adducin. Knockdown of the ATPase in these astrocytes protected motor neurons in co-cultures and in mice. Bonni was excited by these findings because he knew of approved drugs that suppress the activity of these ATPases. The most commonly used is digoxin, which treats heart failure by improving the muscle’s ability to contract. Treating the mSOD1 astrocyte and neuron co-cultures with digoxin rescued the neurons. The authors do not know if digoxin will be protective in mSOD1 mice, but they have crossed those animals with mice that make half the normal amount of α2-Na/K ATPase. SOD1 mice with reduced α2-Na/K ATPase survived 20 days longer than their littermates with normal ATPase levels. To see if people with ALS also overproduce the ATPase, Gallardo and colleagues examined tissue from people who had died from sporadic disease or from familial ALS due to SOD1 mutations. Spinal cord lysates from both groups contained more α-adducin and α2-Na/K ATPase than normal lysates. Bonni said it would be worthwhile to examine lysates from people with other familial forms caused by other genes, such as TDP-43 and C9ORF72. He is also interested in looking at samples from people who had other neurodegenerative diseases where glia are suspected of causing damage, such as Huntington’s (Faideau et al., 2010; Shin et al., 2009). Bonni has received inquiries from ALS patients eager to try digoxin. He cautioned that if digoxin were taken orally at the usual dosage, sufficient amounts might not reach the spinal cord, while higher doses could cause serious side effects, including vomiting and difficulty breathing. The next step, he said, would be to treat ALS model mice by placing digoxin directly into the central nervous system. “If that works, there might be a possibility of going into clinical trials,” Bonni speculated. In the long run, he added, it would be preferable to develop a drug specific for the α2 version of the ATPase. He said ideally, that would be a pill that could be taken orally. Another option would be a biologic, such as a small interfering RNA, that would have to be provided directly to the CNS. Scientists said that while the findings are important, questions remain as to how astrocytes kill motor neurons (see comments below). “This paper has revealed an important and powerful new molecular player … but the hunt for the actual toxic molecule is still on!” wrote Christian Lobsiger of the INSERM Brain and Spinal Cord Institute in Paris. Researchers cannot yet explain how mutant SOD1 boosts α-adducin or α2-Na/K ATPase expression in the astrocytes, nor can they describe how those proteins cause the cells to deliver the death blow to motor neurons.